VIDEO: Part 1 of 3. Texas has some of the best public schools in the country. Some of the highest graduation rates in America. Some of the highest standardized test scores within each demographic cohort. Our outcome disparities-- sometimes people call those achievement gaps-- are smaller than in most states. But Texas also has many hundreds of thousands of kids in hundreds of failing public schools. Nearly three out of every four Texas 8th grade students are not proficient in reading, and three out of five are not proficient in math. Texas faces shortages of skilled workers, even with all the many thousands of Californians and Illinoisans and New Yorkers moving here every year to work for tech firms and finance firms and so forth. Texas universities openly bemoan having to provide remedial education in basic courses for far too many Texas high school graduates (this isn't exclusive to Texas, but still). Texas has some of the most robust non-teaching staff growth in recent years, plus some of the worst school debt in the country (nearly 120 billion dollars). Only half of our education employees actually interact with kids. We spend nearly 60 billion dollars every biennium just on K-12 education, and our skyrocketing property taxes reflect that. What's more: even the best schools may not be right for every kid. Only a true educational marketplace, with a real diversity of supply, with real innovation, and with real choices, can accommodate the diverse demand of Texas kids. While Texas has a lot to brag about, we also have plenty to be downright ashamed of, with regard to our education system. Being better than the rest of the country is nothing to write home about. And unless we want to tax ourselves out of our prosperity, we have to look at serious school finance reform ASAP. Seriously, we need to get this thing fixed as soon as possible, or we're suddenly going to be thought of as a high tax state-- or, at least, not a low tax haven. School choice is coming to Texas. The sooner we all enbrace that, the better off we'll all be. And if you're looking for more details on any of the numbers behind this video, I'll be posting more written content with linked sources in the coming days and weeks. Thanks for watching, liking, commenting, sharing, subscribing, and otherwise engaging with this video! A couple of weeks back, I promised a three-part video series on School Choice. Well, I've been traveling and otherwise busier than anticipated with my day job, but part one is nearly ready to launch, so I wanted to offer a short teaser from it in the meantime. Last month, the Franklin Center hosted a really great conference on the issue of school choice, and I met a lot of fantastic folks. One of the attendees, Bob Weeks, from Wichita, Kansas, posted this great treasure trove of data on school staffing in each state over time. If you play with the interactive visualization, you'll discover than Texas is quite the outlier in terms of administrator growth since 1998. Nearly all states have grown the ranks of their school administrators by between a cone of roughly 10 and 50%. A handful of states now have fewer administrators, and a small few have quite a lot more. The average for all states in 19%. 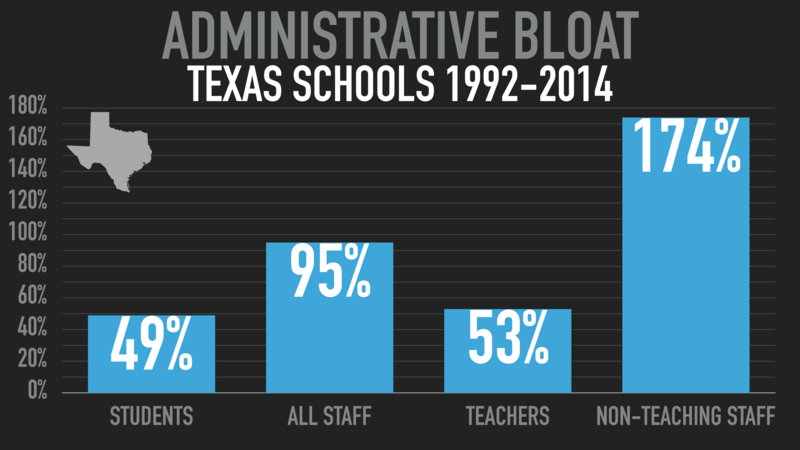 The growth of administrators in Texas: 453%. Just a stunning situation. And not what you might expect from the low tax, limited government Lone Star State. Texas has to do better than this. And we will have to do better than this, if we want to stay Texas, rather than becoming the next California. Stay tuned for the rest of part one, which focuses on the economics of school choice, along with two other videos, focusing on the freedom and the results. I'd love some feedback on this snippet, in the meantime! It's Time For School Choice In Texas. We hear it often. "It's time for school choice in Texas." And then little or nothing happens on the issue. But, lately, it feels... different. Perhaps it's the momentum toward school choice in other states. Perhaps it's a shift in consumer preferences and values toward more bespoke and on-demand options, rather than a couple of flavors or brands of a given product. Perhaps it's the general breakdown of trust in institutions, especially government ones. Or perhaps people are just ready for something new. So why school choice? Why now? Why Texas? Because: math. The numbers support school choice. In terms of Texas' “general revenue” budget, education spending accounts for more than half of outlays. Currently. Already. Eventually, health care spending will catch up, squeezing out essentially every other non-education dollar available, meaning dramatic cuts across the board (and/or dramatic tax hikes). School choice done correctly allows at least a portion of the budget to follow students rather than merely feeding the vast and voracious educational bureaucracy, and it tends to result in efficiency and cost savings while delivering better results. Because families need educational freedom, as a matter of moral principle. Every kid in America deserves a shot. We don't owe anyone equality of outcomes, but we do value equality of opportunity. And every boy and every girl in America deserves an education that fits his or her individual needs. Our education system is one of the few facets of society to cling to an archaic 19th century factory model, emphasizing conformity and mediocrity. Sameness is a virtue, because sameness makes the adults' jobs easier. But education isn't about making adults' jobs easier. It's about educating kids. For far too many kids in Texas, the system is failing to do its one job. Because school choice systems produce better outcomes in the aggregate and for individuals. Better test scores. More kids graduating. More kids taking and scoring well on AP exams. More kids going to college. Competition works in every facet of human life. It drives down costs, while making services more convenient, innovative, effective, and tailored for everyone. Why do we insist on an increasingly antiquated government monopoly for educating our kids? In Texas, we pride ourselves on our freedom. On educational freedom, however, we lag behind not just other red states or other big states but most other states. So what's holding us back? Educrats and lobbyists for the education establishment have enormous power and influence at the Capitol in Austin. I've seen it firsthand. There are a handful of lobbyists and advocates working on behalf of taxpayers and families. There are armies of lobbyists working for the counties and cities and school districts and other entities that always seem to need more. "Local control," so treasured by Texans, has unfortunately become a big (local) government mantra that emphasizes the "control" and only uses the "local" when it's convenient. Schools are seen as a small town jobs program for adults. Unions: while Texas has weak unions, they still exist. And they fight tooth and nail against anything that might weaken their power. Again: adult jobs program. Moreover, there are people who feel like they earned their homes inside of good school districts, therefore why dilute that with more kids? Why dilute it with bad kids? The other reason school choice has lagged in Texas? Our schools are actually not horrible. Our dropout rates are among the lowest in the country. Our national standardized test scores are actually pretty excellent within each demographic cohort. We have smaller racial achievement gaps than most other states. Our schools are-- for the most part-- less segregated by income and race than in many parts of the country. And we have some of the nation’s best individual schools under our current system. Even our public school athletics programs excel. Simultaneously, though, Texas still has chronically failing and perpetually middling public schools. Simply being better than the rest of the country doesn’t mean all that much when the education system is a disaster across the country. 73.5% of Texas 8th grade students are not proficient in reading, and 60% are not proficient in math. Texas faces shortages of skilled workers. Colleges and universities complain about Texas high school graduates requiring remedial education in math and writing and nearly everything else. Texas has some of the worst administrative and non-teaching staff bloat, plus some of the worst school bond indebtedness in the country. And our skyrocketing property taxes reflect that. In the next few weeks, I’ll be posting a three-part video series on school choice in Texas here and on YouTube. I'll explore school choice through three lenses: 1) the economics, 2) the freedom, and 3) the results. I hope you'll check back and give each short video a watch and a share on your social media platform of choice. Or, at least some serious consideration. Stay tuned!